Throughout the morning the Germans mopped up British survivors and stragglers in hiding around Arnhem bridge. It took several hours to clear the bridge of debris allowing German armour to cross and reinforce Nijmegen. 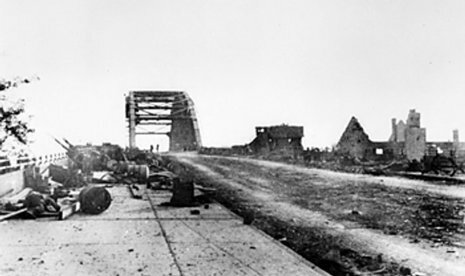 Crucially, the British had held the bridge long enough to allow Nijmegen bridge to be captured by the 82nd Airborne. With the resistance at the bridge crushed, the Germans had more troops available to commit to the Oosterbeek engagement, although this changed suddenly in the afternoon. Two days late, the parachute infantry battalions of Stanisław Sosabowski's 1st (Polish) Parachute Brigade were able to take off in England. 114 C-47s took off but 41 aircraft turned back after Troop Carrier Command decided it would be too dangerous to land if the aircraft were up too long. The remainder pressed on — they did not have the correct transmission codes and did not understand the messages. One of the few messages to get out of Arnhem warned the Poles that DZ 'K' was not secure and to land instead on the polder east of Driel where they should secure the Heveadorp ferry on the south bank of the Rhine. The Poles dropped under fire at 5pm and sustained casualties but assembled in good order. Advancing to the river bank they discovered that the ferry was gone - the ferryman had sunk it to deny its use to the Germans. 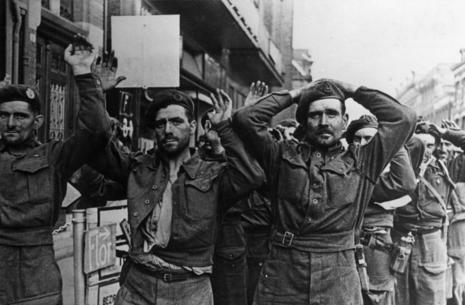 The arrival of the Poles relieved the pressure on the British as the Germans were forced to send more forces south of the Rhine. Fearing an attack on the southern end of the road bridge or the Nijmegen road, a battalion of the 34th SS Volunteer Grenadier Division Landstorm Nederland, Machine Gun Battalion 47 and other Kampfgruppes headed across the river overnight. At 08:00 on Thursday morning, the Germans began a concentrated attack on the 1st Airborne positions. The most damaging incident took place around the Westerbouwing Restaurant, situated on the high ground in the extreme south-west of the Perimeter, which was defended by "B" Company of the 1st Border (Map Ref 22).